In search of geysers and hot springs the locations of active, dormant, or even extinct volcanoes are a good starting point. Volcanic activity in the United States is focused, except for Hawaii and few other locations, on the Pacific Ring of Fire along the American West Coast. Numerous volcanoes of different types, lava domes, and cinder cones are lined up as Cascade Range through the states of California, Oregon, and Washington. Others are to be found in Alaska. Accordingly, the list of places with hydrothermal features in volcanic areas of the US is quite long. 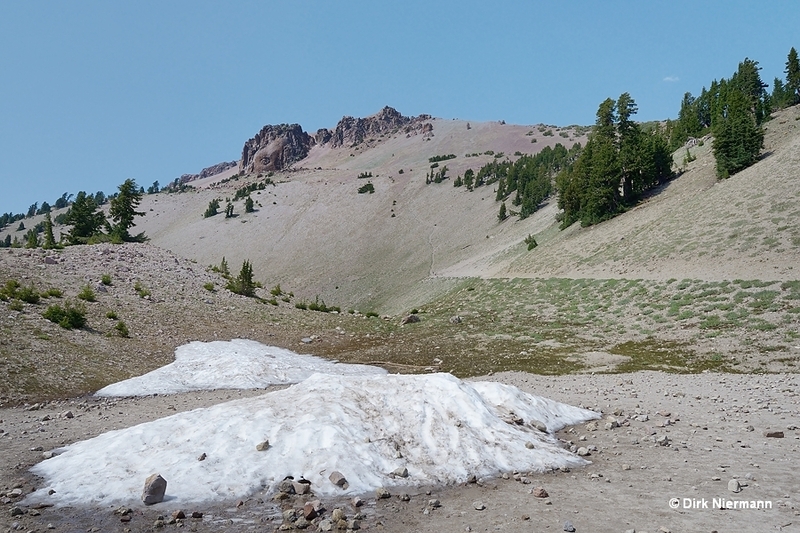 Lassen Volcanic National Park in California is an example of a volcano-related high-temperature area in the Cascade Range with a good number of hot springs, mud pots and fumaroles. However, no true geysers are occurring here. In contrast to the plate-tectonic driven volcanoes of the Pacific Ring of Fire, Yellowstone in Wyoming's Rocky Mountains is a classic example of a volcanic hot spot caused by an ascending magmatic mantle plume. Throughout the last 2 million years the Yellowstone Volcano has erupted 3 times with an average cycle of 600,000 years and thus formed a caldera 45 by 35 miles wide. The last eruption took place around 640,000 years ago, but this does not necessarily mean that the next eruptive event is past due. Since the late 1980s scientific investigations have revealed step by step that the ancient volcanic activity has to be attributed to a "super volcano", coming with two connected, giantic magma chambers. The smaller one is extending down to a depth of 4.8 to 16 km (3 to 10 mi) and the larger one to a depth of 20 to 48 km (12.5 to 30 mi) beneath the Yellowstone caldera. At the bottom separated by an approximately 15 km (10 mi) thick solid, but fissured layer of the uppermost mantle, the lower chamber is heated and fed with magma by the magmatic mantle plume, which descends 2900 km (1800 mi) deep down to the planet's molten outer core. In terms of geysers and hot springs the Yellowstone National Park outshines all other locations worldwide. Comprising more than 700 geysers (around 300 of them are regarded as active) and more than 10,000 hot springs, it is by far the largest field of hydrothermal features on earth. A more current count by the Geyser Observation and Study Association (GOSA) in 2012 even resulted in a number of nearly 1300 geysers ever observed in the park. Over 60% of all known geysers are to be found here. 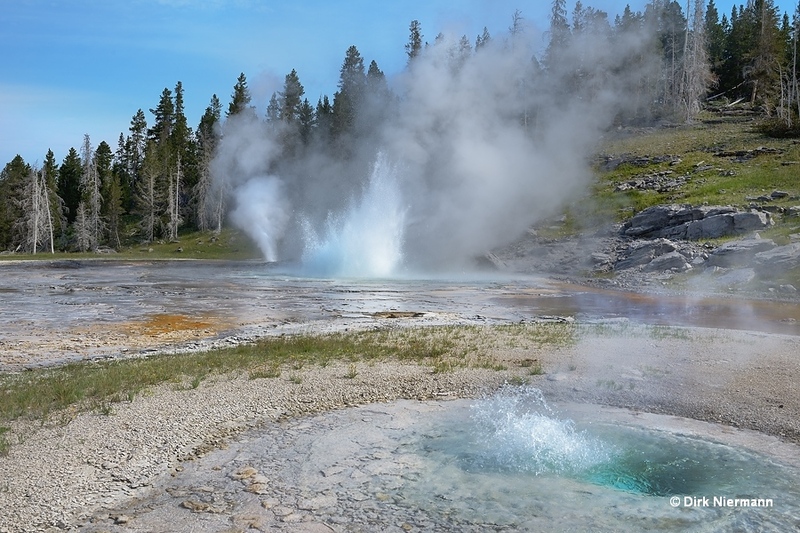 A huge number of hot springs and also geysers on the territories of Oregon, Idaho, Nevada, and California are appearing apart from volcanic heat sources. 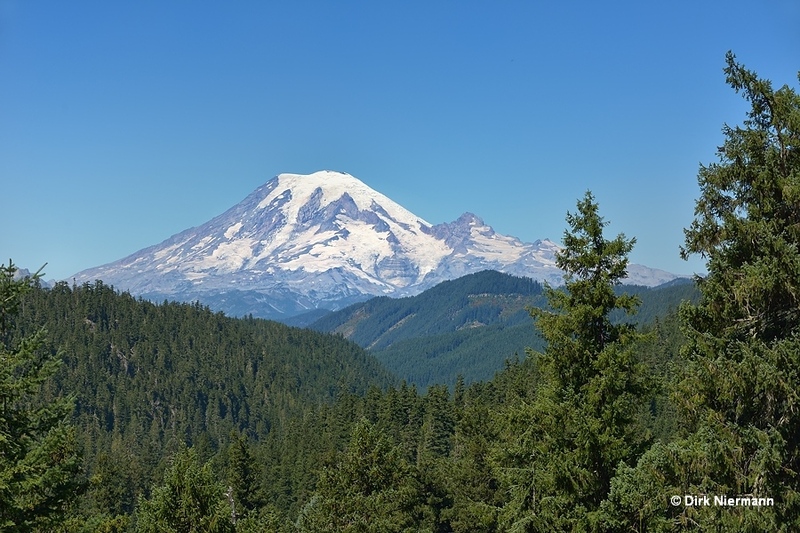 They occupy the area between the Cascade Range and Sierra Nevada on the west and the Rocky Mountains on the east and are probably powered by the same tectonic movement processes that raised the mountain ranges. The Beowawe sinter terrace in north-central Nevada was second to Yellowstone for its number of active geysers, but otherwise the small area featured the highest density of generally active natural geysers in North America. It was located on a slope in Whirlwind Valley, 15 km (5 mi) southwest of the village of Beowawe. Nowadays, a gravel road cuts right through the terrace, and all geysers and springs are dry as a result of geothermal drilling, which started in 1957. The destruction work was completed by bulldozing debris into the remaining vents to prevent the production wells from a loss of steam. Prior to 1957, Donald E. White, a leading geologist for the U.S. Geological Survey, studied the geyser field over 12 years. In the U.S. Geological Survey Bulletin The Beowawe Geysers, Nevada, before Geothermal Development from 1998 he documented the positions of 28 active geysers, even attached fascinating color photographs of the main geysers, and mapped several further hot springs. White also described 7 named geysers on the field in more detail, as well as two unnamed ones. Beowawe Geyser was the most prominent and the largest of all. It erupted for 2 minutes to a height of 8-10 m (26-33 feet) at an interval of 30 minutes or longer. The same interval was found for Spitfire Geyser, which reached a height of 3-5 m (10-16 feet). Another large geyser was called Teakettle Geyser, spouting water form two vents up to 5 m (16 feet) into the air at an interval about 6 minutes. White Flame Geyser exhibited cyclic activity and played every 7 minutes to a height of 1.3 m (4 feet). In contrast, the vent of Orange Spouter caught the eye for its bright color rather than for a strong or frequent play. A pile of sinter covered boulders was the reason for Pincushion Geyser’s name. The boulders were possibly implaced by Indians and formed six vents for the geyser to erupt. Frying Pan Geyser was splashing up to 60 cm (2 feet) out of a large blue pool, sitting at the foot of the slope. A picture of Frying Pan Geyser, taken in 1983, can be seen here. Last but not least, one of the unnamed geysers on location was active during every of White's visits over the 12 years observation period, erupting for at least 10 minutes to a height of about 3 m (10 feet). There are bitter comments on the internet from people who observed the destruction or even tried to prevent it back in the 1950s. Most of them come to the conclusion that the people and the state of Nevada lost a gem of nature and all the economical chances coming with an unique nature reserve. On the other hand, they got an inferior, temporally limited energy source to a benefit of a few. Nearly the same sad history applied to the Steamboat Springs, the third largest geyser field of North America, 14 km (9 mi) south of Reno in Nevada. On three sinter terraces, Lower, Main, and High Terrace, 25 geysers were recorded. Up until 1860, one of them spouted up to 25 m (80 feet) high. Thereafter, an increasing utilization of hot water diminished the power of the geysers, but at least 21 of them remained active until 1987. Then the State of Nevada allowed a company to exploit geothermal energy near the geyser field, which lowered the water table drastically and ceased all geyser activity, probably forever. In contrast to Yellowstone and to Beowawe, none of the geysers at Steamboat Springs had been officially named, instead a number system was used, introduced by Donald E. White. Content and photos on this homepage are protected by law. You may save photos on your Computer, but it is not allowed to use them in any other case without permission of the author. If you want to use photos originated by the author, please ask. Please respect licence conditions of photos of third parties on this homepage.